Wuxia – from the Chinese ‘wu’ (martial) and ‘xia’ (chivalry) – can most simply be defined as Chinese swords and sorcery. Chinese culture, or this particular offshoot of it, has not yet been pilfered by the west in Bollywood, but with Crouching Tiger, Hidden Dragon, Hero and the forthcoming House of Flying Daggers crossing over, the martial arts movie is moving away from its Hong Kong roots and into the mainstream. 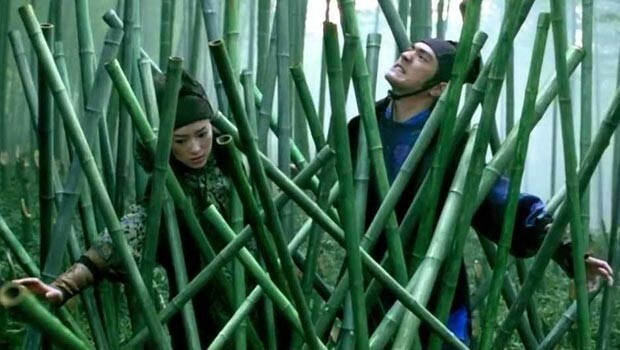 Your typical Wuxia film will feature some or all of the following, in no particular order: a fight in a bamboo forest; a knight-errant, preferably an outlaw; a chivalric code; secret societies; honest peasants; super powers. Many of the films are based on novels rooted in a mythical China. In Japan only samurai could carry swords, but in ancient China anyone could become a professional swordsman. Since rival warlords ruled the land, an unattached fighter could become a killer for hire. This rather sordid reality was glamorised in the wuxia tales which, like Arthurian legend, promoted a concept of knightly virtue. The roaming hero used his strength and skill to fight for ‘yi’ (righteousness) not in the abstract but in the concrete sense of righting specific wrongs. Political history is relevant here. China has had an unhappy history of rule by one corrupt and tyrannical regime after another. The wuxia knight-errant stood for justice in a society where law held no sway, and the revenge motif took on moral resonance through a Confucian notion of obligation: the child owes a duty to the father, the pupil to the teacher. Wuxia plots often present a struggle between social loyalty and personal desire. Li Mu-Bai in Crouching Tiger is ready to retire from the Giang Hu world and live peacefully with his love, Shu-Lien, but first he must revenge the death of his teacher at the hands of the renegade Jade Fox. This notion of self-sacrifice is what Jen, dazzled by the idea of individual freedom, fails to understand until it is too late. Rule Number Two: There shall be wires. Another mini history lesson! Wuxia plots entered the Peking Opera in the 19th century, and the novels became mass literature in Shanghai shortly afterwards. With the emergence of Chinese filmmaking in the 1920s, screenwriters drew stories from martial arts plays and novels. ‘Burning of the Red Lotus Monastery’ (1928), the progenitor of the fantasy film, used flying daggers, wirework and employed over 300 martial artists. Banned in China in the 930s, in the 1950’s and 60’s Cantonese films reinvented the genre, emphasising the fantastic with warriors soaring through the air and emitting bolts of lightning from their hands (palm power). In reaction to this came the ‘new wuxia pian’ filmed in mandarin and emphasising more realistic swordplay. The warriors still possessed astonishing abilities but any disciplined fighter could acquire these through practise and study. The emphasis in Crouching Tiger is on self-control allied with natural gifts, while in House of Flying Daggers the protagonists superhuman powers seem to be innate and are taken for granted. Western audiences happy to accept elves, hobbits, Spiderman and the X-Men have been sometimes reluctant to suspend their disbelief when it comes to wuxia, though it’s no more fantastic. It seems weird not to think that there was a time when we hadn’t heard of Yuen Wo-Ping, legendary choreographer and director, and the man behind the stunts in The Matrix Trilogy and Kill Bill Vols 1 and 2, as well as Crouching Tiger, Hidden Dragon and Drunken Master. His influence on the genre (as well as a million spoofs and rip-offs) cannot be overstated. Just as commoners could carry swords, there was no prohibition against women adventurers, and in fact they are central to the tradition. The films often take pleasure in contrasting their styles with men’s, and the genre has produced a number of legendary actresses: Cheng Pei Pei, known as the Queen of wuxia pian; Brigitte Lin; Maggie Cheung; Michelle Yeoh, and, of course, Zhang Ziyi. Ang Lee commented, discussing CTHD, that ‘Women do a lot of the things men do in this genre. They embrace the Tao, they take the duels. The women are gutsy and they make decisions, one way or another.’ Western audiences have been surprised that women are so central to the genre. The Wudan tradition, as opposed to Kung Fu/Shaolin martial arts, is about finding internal strength and centredness, rather than an explosive, raw action. The fight scenes in CTHD, Hero, and House of Flying Daggers are beautiful, balletic, and violent. There is no question that Jen is not as formidable a fighter as Li Mui-Bai, or that Mei can’t hold her own again Jin. A Touch of Zen (1971) by King Hu introduced perhaps the most famous, and certainly most imitated scene in wuxia, with a fight unfolding in a quiet bamboo grove. Hu bought the energy and finesse of classical Chinese theatre to the martial arts movies, lingering on breathtaking landscapes and treating swordfights as airborne ballets. His influence on directors like Lee and Zhang Yimou is obvious. Yimou embraces this legacy most particularly in House of Flying Daggers, which he calls a tribute to wuxia. Zhang was most worried about the bamboo forest – he had to include it, but wondered how to make it his own. His answer was to shoot the scene on two levels, with the enemy attacking from above while the lovers remained on the ground.